Snapchat has always been a great way for your special lady friend to take ridiculous selfies. You’re sick of seeing butterfly crowns and unicorn faces, aren’t you? What good is Snapchat for dudes who want to be dudes? That is where Beardilizer steps in to help you man up your social media. Beardilizer promises nothing but the best snaps – no chit-chatting about dumb stuff nobody cares about or pictures of food that you may or may not be eating (seriously, ladies, why do you take pictures of cupcakes when the next snap is you like hanging out with your #fitfam at the gym). We promise to deliver nothing but pure, raw, masculine beardo energy. When Beardilizer got into the Snapchat game we realized that our snaps would have to be different than the thousands of nonsense snaps out there. All of the snaps that BEardilizer puts out will be based off of beards; nothing but beards, beards, beards. When Beardilizer goes to competitions we will snapping. Our team travels around the world and using Snapchat allows all of us here at Beardilizer to send out beard specific content instantly. If we post promotions that are exclusive to the Beardilizer family, Snapchat is an easy way to touch base with our die-hard beardos. Snapchat is more than dumb filters, after all. The beardo revolution is on us; the world continues to grow their appreciation for beards. Just like beards, this love never stops growing and continues to get bigger and bushier. Whenever anyone thinks beards they think about our Beardilizer team – those dudes win awards and are excellent members of society. 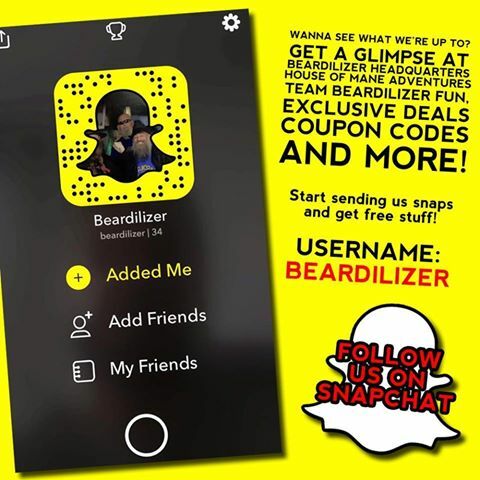 Whenever anyone on Team Beardilizer has a personal victory with their beard or with their community, bearded or not, Beardilizer will be there for those awesome snaps; sharing the successes of Team Beardilizer is one of the perks of being connected to a great group of dudes. A beardo community is unlike any other group in the world. That’s why using Snapchat to reach these beardos is so great. It takes seconds to send a snap of a great beard; there is no bullsh!t posing in the mirror and taking a thousand pictures. Beards just look great – there is no way to get around that. When you’ve got a beard that has been cultivated with BEardilizer products you don’t nbeed to worry about finding good lighting or using a filter or seven. You know that your beard is perfect. Download Snapchat and add ‘Beardilizer’ as soon as possible. Seriously, if you want your social media to be all beard, all of the time, Beardilizer should be your Snapchat best friend. Even if you are into filters think about how awesome it is to be so connected to Team Beardo. Or if you feel so compelled to take some snaps with those pretty, pretty princess filters send them on to Beardilizer. After all, you are a pretty, pretty bearded princess and those are the best kind of princesses or at least that is what Beardilizer thinks.